St Peter's Church ChurchSaint Peter's is the town's parish church and one of the largest churches in the Diocese of St David's in the CHURCH IN WALES in the Anglican Communion. Services are held in the English language (Welsh language services are held in the daughter church, Eglwys Sant Ioan - St John's Church, in the town). The two churches have a combined membership of 500. Eleventh century St Peter's has been having a much-needed 'facelift' over the last few years. The restoration programme involved work on both the exterior and interior of the building. The floor of the Chancel and Consistory Court had to be removed and a new re-enforced replacement floor constructed. This entailed the temporary specialist removal of the magnificent eighteenth century George III pipe organ as well as the temporary removal of the choir stalls etc. Archaeologists were in attendance during September and October, 2000. Whilst the necessary construction was underway, the organ was repaired by organ experts at their Malvern (Worcestershire) organ works. The new floor was re-tiled with the original nineteenth century tiles. Much needed weatherproofing work to the tower was undertaken during 2001 and, in 2002, all the ancient monuments within the church were cleaned and restored. 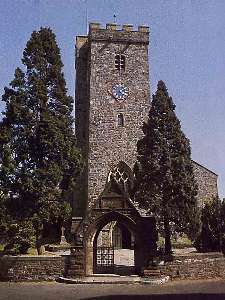 Saint Peter's is the town's parish church and one of the largest churches in the Diocese of St David's in the CHURCH IN WALES in the Anglican Communion.